Posted by Pat Boomer on Tuesday, May 13th, 2014 @ 3:08 pm. The longer I wait the more I forget, better make a note of the August goodies around the neighborhood before 2014 arrives. Not a lot to remember this year from the Alberta storm season, other than the hail. Or perhaps you live in Lethbridge. 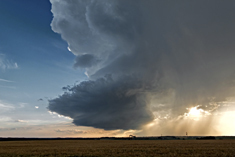 One, maybe two tornadoes, a few nice supercells here and there, but a rather strange season all in all. Plenty of storm action for both Edmonton and Calgary, more storms than normal south of Calgary, and only a few gooders in the alley from Sundre to Rocky Mountain House. Very little hail damage that I know of in the places it often piles up the worst. Seemingly endless northwest flow off the foothills kept the storms mostly pinned to the hills and headed south, belching out northwest or west of Calgary. The crops around here look fantastic because of it. Still got some good miles in, but I can’t remember a year when I failed to get a camera out of the bag on so many trips. More times than I like, a tour wound up with an early u turn and return to base. I guess it’s a price you pay when you move to the fishbowl that is life in the city and can see nothing but up. Twitter was abuzz on August 4 with photos of a neat funnel hanging out of a rather unspectacular cloud somewhere around Eckville, so went out to get a treat and see if anything would try as it came over Red Deer. 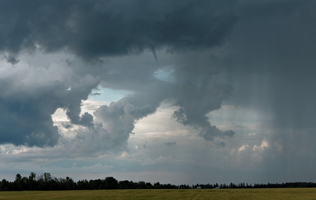 No sooner had we gotten out of city limits to the east, and a tiny little funnel poked out for us to take it’s photo. The next interesting cloud that passed by was late on Aug.11, zapping all over the place, but rarely where I was pointing the camera. August 13 was a nice day for a drive in the Alberta foothills. I had originally gone out to check on a storm that looked like it might take a run out of the hills toward Caroline, and while it looked pretty juicy from the north, it was diving well to the southeast by the time I got up to it. Without the Garrington bridge for a bailout option I decided not to risk a coring and headed out into the hills west of Cow Lake to see if the nice puffs billowing out there would turn into anything. Eventually the south end cell wound itself up enough to develop a nice wall cloud, but finding a photo spot out there is a challenge, luckily it waited long enough to have it’s pic taken for me to find a view before it completely evaporated within half an hour. Smoke from fires in Washington state did not help in getting a clear shot, but still a nice trip. August 16 was a total bonus day. A few small storms had been muttering around to the northwest and southwest, but didn’t look like they were going to get far. One started to look good around Rimbey, headed for the Red Deer area, so we went for a evening tour. It fell apart as soon as we got out north of Sylvan Lake and we thought that was the end of it, but no. A cell quickly blew up near Rocky Mountain House so we headed west for a look. As it headed east toward Eckville it started to look very nice very quickly, and before we knew it, we were almost under it. In flee mode to the south, it followed us south after a split, just as the hail plane arrived. We got to watch a classic supercell spin away for another half hour before it fell apart just west of Red Deer. August 26 was one of those days when the photo cameras stayed in the bag. Did get the video camera out while I sat on Stauffer road for almost 1.5 hours watching a struggling cell southeast of Rocky Mountain House get pulled and pushed around before it finally fuzzed out. 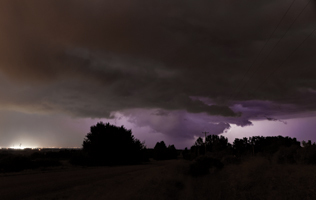 That evening I headed out again to the north for a frustrating and mostly futile lightning chase. 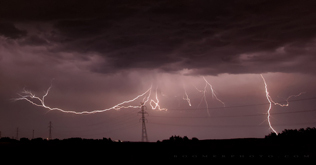 Set up, get lightning in frame, then nothing, it has jumped 10 miles east. Chase east, set up, repeat. I finally grabbed a few shots from a high hill east of Lacombe as it ran away. The little nerdicle of a cell that produced the lightning on the 28th of August sure didn’t look like much on RADAR and we didn’t make a move until we could see flashes from within the city, it wasn’t that angry but did dish out some nice zots. There was a lot more going on the next night, but the half hour that lightning was flashing over the city was spent trying to find the camera remote that I had misplaced the night before. Posted by Pat Boomer on Friday, September 13th, 2013 @ 11:30 am. 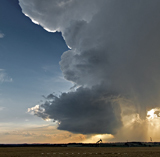 The summer of 2013 is going to be a tough one to beat, at least as far as hail is concerned. The damage caused by the Great White Combine is going to be off the scale when everything gets added up. 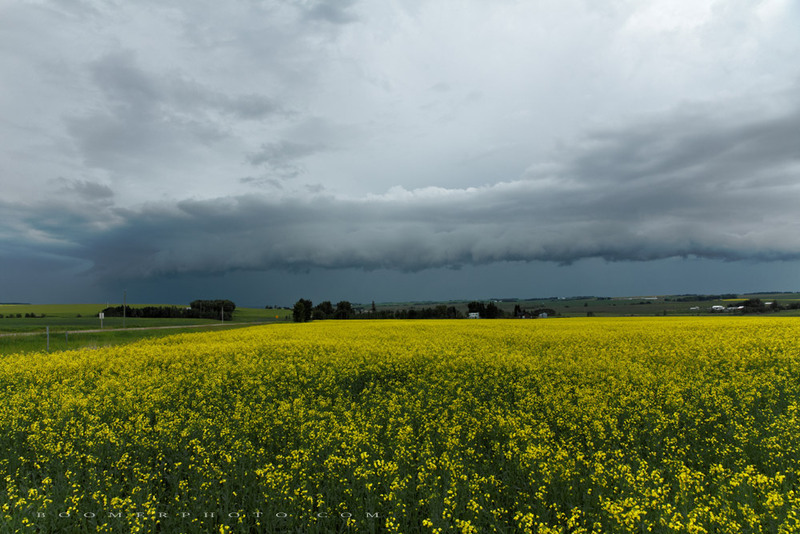 On the 17th, Brandon Brown stopped by and picked me up for an afternoon of stormwatching west of Airdrie. It was an iffy setup but there was a chance of goodies popping out of the hills so we watched and waited, but nothing much materialized for us. Lethbridge, on the other end of the line, got hit hard by a nasty supercell that blew out right over the city. Wind gusts approaching 140kmh along with hail and torrential rain caused a great deal of damage, then tore a new scar across the land to the east of the city. July 20th it was our turn. We took a casual spin on the back roads around Gull Lake out towards Drayton Valley to see what might fly out of the hills, getting to our favorite watching spot in Alder Flats in time to get a bit of a tan before things started up. 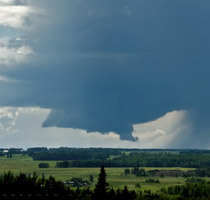 The first cell started up to the west of Drayton Valley, a thin band of low level cloud heading west flared up on the west end and quickly turned into a healthy updraft base, then took off east. We decided to hang back and wait for the next little spot of lift that was still well to the west, and in about 20 minutes it took off, quickly forming up a base, then a wall cloud as it pushed out to the southeast. From Alder Flats, it chased us southeast at a good clip, not leaving us much time to stand and stare, cycling from looking amazing to looking crummy at least 4 times. The storm to the east that we had we left to watch the west one was still tracking along, looking mean on RADAR but we could not see it in the bush corridor that is hwy#22, until we were almost to Rimbey. 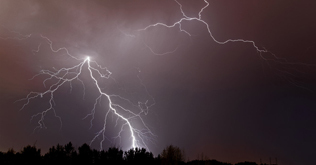 It was looking very rude when we finally got sight of it, dropping huge pink bolts of lightning over the north end of Gull Lake and packing a very ugly and big core of what we assumed would be mostly hail. 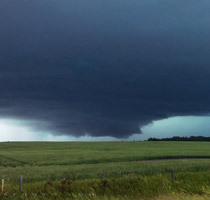 We stuck with the cell tracking towards Red Deer, hoping the one to the east would slide between towns, and by the time we got to hwy#12 north of Eckville, ours had stretched out into more of a shelfy looking thing but that didn’t last for long. Within 20 minutes it had gathered up into a mean looking beast again, just north of Sylvan Lake and seemed to be picking up speed, taking aim at Red Deer. There was no stopping after than point, we made haste towards the city, watching it get uglier by the minute, then halfway to Red Deer it got really mad. Huge cloud to ground bolts were lighting up a concentrated mass to our north and it looked like we might get mowed before we got home. No more than 3 minutes after the garage door closed the hail started, mostly dime and quarter sized with a few toonies in there, within 5 minutes it stopped, then a few minutes later we got a short dose of peas and 20mm of rain. When the rain stopped we went to see if we could catch a bolt of lightning or two from the next storm in line, but that didn’t work out so good. Moments after we got the tripods set up we were taking them down, looking over our shoulders at a line of white stuff flying across the city lights to the northwest. We were only a few minutes from home but it still caught us, luckily only torrential rain and big wind. We went out for a look the next day to see what had happened, trolling around Red Deer for a while, not seeing much but a few trees down, lots of broken branches and general leaf/garden shred. 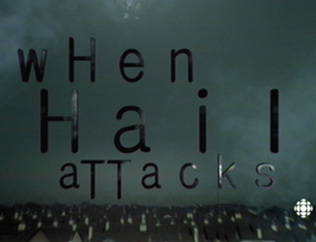 There were reports of golf balls in the city, broken windows and torn up siding, but we didn’t see any. We decided to do a bit of a trackback of places we passed the day before on our way north, thinking there must be an awful lot of damage to the beautiful crops around Gull Lake, but were completely surprised by what we actually found. A strip of moderately chewed crops near the Blindman river southwest of Bentley, then nothing but gorgeous thick crops up the west side of Gull Lake. We found a narrow strip of well chewed stuff north of Gull Lake, then found the same strip on the east side of the lake, half way between #53 and #12 which we followed toward Lacombe. Perhaps a mile wide, with a half mile width of heavier shred in the middle to that point, it widened out a whole bunch just a few miles northwest of Lacombe. Suddenly we were seeing a lot of wind damage as well, many big trees blown over, grain bins pushed over, tin roofs peeled back. Canola here had not been pounded flat, but stripped bare, a sign of smaller hail with big wind. Corn and soy beans were beat up pretty good, but not completely hammered into the ground. Although the direction of the wind damage had all been from northwest to southeast on everything we saw up to the QE2, on the north end of Lacombe we saw signs of the wind howling from the south, stripped off canola stalks pointing northeast and a big highway sign broken off northward. Lacombe itself got pretty lucky from what we saw. Although we heard reports of destroyed siding and broken windows, all we saw on our tour through the north side of town was a lot of broken trees, a few bits of torn off flashing, and maybe a few holes in the siding of a few houses and a great deal of leaf shred along with many pounded gardens. We looked closely for dinged up cars but found none, some dirty cars had good sized clean marks that had obviously been caused by large hail, but it must have been on the soft side. A slow trip trough a car dealership showed only a few tiny dents on a handful of vehicles. We went east of town and south again but didn’t find anything more than chewed up gardens and a few branches down. The foothills lit up again on the 21st, tricking me into heading west for a look. By the time I got to Spruceview it was obvious they were foothills cheaters and were just riding down the edge of the mountains toward Calgary so I turned around at Raven and went home to watch on the interweb. The meanest looking storm of the day fizzled out and died before it got anywhere close to Calgary. It’s going to be a billion dollar July for sure. Posted by Pat Boomer on Tuesday, July 23rd, 2013 @ 5:41 pm. July 11th turned into more than I thought it was going to. Soft looking storms brewed up near Rocky early in the afternoon in a northwest flow, I debated even going for a look but curiosity killed the cat as they say. It was a shelfy, cold looking mess for most of the time I spent watching it west of Penhold, cold north wind was out almost 10km ahead of it then about 15 km west it started to build a little structure and divide itself up a bit. It was clipping right along but didn’t look too scary, it looked like it might have a hail core on the south side of it but was hard to tell until I stopped for a quick photo and got a dime sized hail nut right to the skull. The first one to fall. Expecting golfballs next I took off east. The silly thing chased me toward Pine Lake, I’d stop every few miles to see if there was still nuts in there, until I was almost to Pine Lake before they stopped. 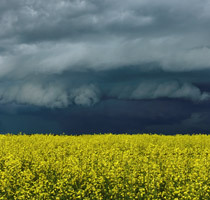 There must have been a thin sheet of it out front of the rain because I couldn’t even find a spot on the way back where the flowers had been knocked off the canola. Completely devoid of structure when I bailed out, the next cell south gathered itself up to the east and gave some nice photo ops around Drumheller. July 14 was a better show. We were parked out north of Olds watching to see if the storm just west of there was going to do anything, keeping an eye on a sickly looking thing with a raggedy anvil due west of us, still out in the hills by Bearberry . It looked like a warm push upstairs from the southwest was killing off the Olds storm and we thought about heading towards some more interesting stuff near Rocky Mountain House, when the little nerdle suddenly caught a big breath and developed into a classic low precip foothills beauty. We sat on the east side of Eagle hill and watched it for almost an hour until it got the same dose of warm midlevel air from the south that killed off it’s buddy near Olds. RADAR was showing some interesting stuff around Rocky so we headed north and met up with it as it was near Eckville. Low level bands of convection were pushing in from the southeast, meeting the flow from the west in a dark and sometimes very green convergence that looked like it was going to mow over Sylvan lake. Not sure what happened there but quite suddenly it dumped out and died down pretty fast. There were some interesting looking things buried in the precip but we never got a good enough look to see what was actually happening in there and we weren’t going any closer to find out. Sounds like a tour is in order for tomorrow, fingers crossed for some foothills goodies. Posted by Pat Boomer on Tuesday, July 16th, 2013 @ 11:52 pm. 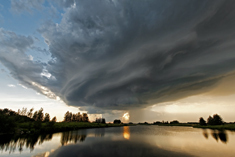 The first time I saw a hail scar across the farmland of Alberta was in early August 2009 after a brutal night storm tore a strip from Rocky Mountain House almost to the US border, nearly 400km long (link). Now we have five scars in one week, there is a lot of salad in southern Alberta. The biggest one is a swath from right around Granum across the south edge of Lethbridge and almost to to US border. Google earth measures it at 140km. Another smaller scar right over Taber and off to the east a few km. Another short one near Stavely and yet another northeast of Nanton. Two more good sized scars south of the border in Montana. The ugliest one stretches ~60km from just east of Airdrie to the Rockyview area. This scar has had most of the crops pounded to little bits, and even the bits have been stripped of their green. 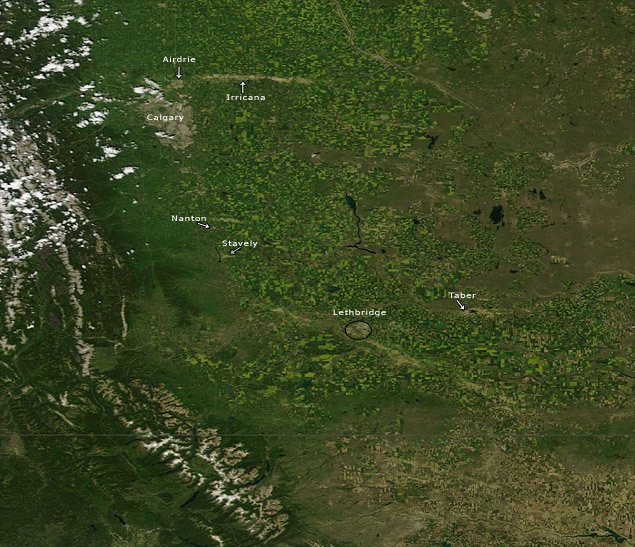 You can surf back to images from the beginning of the month to see a scar-free Alberta at the NASA Worldview site. Posted by Pat Boomer on Thursday, July 11th, 2013 @ 12:38 pm.